Billy Richards is new to the team this year, grew up in Islip, and left for the Marine Corps after graduating High School in 1999. He was stationed on Camp LeJeune with 1st Battalion 8th Marines during his first enlistment, deploying twice, once to the Mediterranean Sea with the 22nd MEU(SOC,) then the second time in support of Operation Iraqi Freedom, and JTF Liberia with the 26th MEU(SOC.) By MOS, he was an 0311(Basic Rifleman,) but has held many other billets, to include SAW gunner for the MSPF Security Plt, Training NCO, Police Sgt, and was the lead instructor charge of the Marine Corps Martial Arts Program for Headquarters and Service Company. After his 4 years of service, he completed his Associates Degree in Criminal Justice. When he completed college, he realized his true passion was in fitness and became a personal trainer, starting out working for Bally Total Fitness in Bay Shore, from 2005 to 2006, then at Gold’s Gym in Islip from 2006 to 2009. In 2009, he did a second term of service in the United States Army, being stationed at Ft Bragg, starting out as a Special Forces Student, and then finishing his enlistment with the 82nd Airborne Division. While at Ft Bragg, he started competing in endurance events, with his very first race being the Army Birthday 10 miler. Crossing the finish line was a great achievement to him and he would go on to complete close to 200 fitness events. 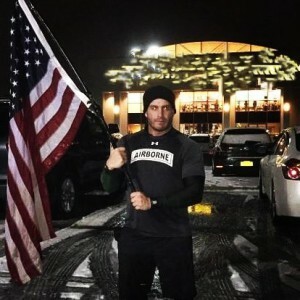 After his tour of duty with the Army, he returned home to Islip in 2012, and went back to school for fitness, and reentered the Personal Training world, working at the New York Sports Club on 49th and Broadway in Times Square for a year, then returning to the Gold’s Gym in Islip at the end of 2014 to be closer to home so he could take care of his father. Since entering the endurance world, he has completed hundreds of foot races, 10 Tough Mudders, over 40 Spartan Races, was on the winning team at the 2014 Team Death Race in Pittsfield, VT, has 8 Spartan Trifectas, 10 Marathon Finishes, 4 Ultra Marathon Finishes (a 70k, 50k, 50 miler and 100 miler) Spartan Ultra Beast finisher, 2 time World’s Toughest Mudder Contender, competed in 2 CrossFit competitions and winning the Winter Throwdown Novice Division in 2013. He has been certified through the National Academy of Sports Medicine as a Personal Trainer, Corrective Exercise Specialist and Performance Enhancement Specialist, through the American Council of Exercise as a Personal Trainer, Health Coach, Advanced Health and Fitness Specialist, Medical Exercise Specialist, Fitness Nutrition Specialist, Orthopedic Exercise Specialist, and Sports Conditioning Specialist, he’s also been certified as a Level 1 CrossFit Coach, Spartan SGX Coach, CHEK Exercise Coach, Mat Level 1 Pilates Instructor, and formerly a Certified Fitness Trainer and Water Fitness Trainer through ISSA. He currently runs all events as of 4th of July of 2014 with a 45 pound military ruck sack, and the following year as of July 4th of 2015 he started carrying the American Flag along with the ruck sack, as a tribute to his fellow service members, past and present, fighting the war on terror, keeping his Marine Corps Spirit alive, and in 2016, has now decided to unite with fellow service members and veterans of the Airborne Tri Team, to conquer the Triathlon Realm, in hopes of achieving the goal of finishing an Ironman.